Hush Smoke Alarm 4" with Hush Button Battery operated. Easy installation. Battery included. Economical way to defend against water leaks in multiple locations throughout the home. Detects water 1/16" deep. Ideal for use in areas not usually observed: Water heaters - behind washing machines or dishwashers - under refrigerator for ice makers - under sinks - sump pumps of inside pits - toilets - behind or near media systems. Provides early warning of potentially costly water damage. Alarm sounds for up to 24 hours (dependent upon battery life). Low battery chirp. Requires 9V battery (sold separately). Detects entry ? instant alarm. Warms that door or window has been opened. Ideal for areas where children should not go. Installs with double-sided tape included. Warning stickers included. Protect sliding windows and doors from forced entry. Adjustable track widht. Alarm is activate by movement againts the block or glass shock. Built-in vibration sensor an high alarm up to 100 DB. All purpose. For use in all rooms. 9V battery included. Low battery indicatore. Easy to install. Photoelectric sensor. Test button and HUSH button to silence alarm. No wiring required. 10 year limited warranty. 120 V AC wire-in. AC power light (green). Rapid flashing red LED light indicates which unit in the multi-station installation is the originating alarm. Test button and HUSH button to silence alarm. Single or multi-station capability (up to 24 units). Activates alarm or music. Built-in 105 DB high output alarm. Alarm/off/music option whtich. Two meter long connection sensor wire. Battery operated ( 2 - 9 V batteries included). Press Hush button to temporarily silence false alarms. Alarm resets automatically after about seven minutes. in case of dense smoke, the Lifesaver alarm circultry overrides the Hush button to sound the alarm. Red light flashes every 30-40 seconds to indicate that alarm is receiving power. Test button checks horn, battery and alarm circuitry. Low battery indicator: Unit sounds a warning chirp if battery is low. Special mounting bracket for fast installation. Twist-off mounting makes battery replacement easy and safe. Tamper resistant locking pin to deter theft. Test button and flashing LED, allows simple verification of battery and alarm operation. Hush button, quickly silences nuisance alarms and automatically resets after 7 minutes. Saftery light can illuminate a hallway for improved navigation in the dark. Be warned when a door or gate has been opened. The SK637 is a magnetic contact alarm that can be used both indoors & outdoors. One side of the contact is installed on the frame of the door or gate & the other contact is mounted on the door. As the door or gate is opened, & the distance between the contacts exceeds ?? the loud alarm will sound for 10 seconds, stop for 10 seconds & then repeat even if the door is reclosed. A PASS CODE is required to either avoid the alarm sounding or to stop the alarm. A built in BY-PASS is used to temporarily open the door or gate without sounding the alarm. The alarm will automatically re-arm itself in 15 seconds. The PASS CODE can be customized. The unit is weather resistant. The alarm is a loud 105dB & features a low battery indicator. The SK637 is quick & easy to install & includes batteries & installation accessories. Carbon Monoxide Alarm for general purpose use. Battery Operated for a flexible installation for areas with no AC outlets. Test/ Reset Button-Tests CO alarm circuit operation and resets alarm. White. Worry Free-Battery never needs changing for the life of the alarm-last 10 years from activation, ideal for bedroom detect fires quickly and reduces false alarms, talking warns you of danger and help to wake sleeping family members, hush button allows you to quickly silence nuisance alarms, sealed lithium battery for life of unit Worry free-Battery never needs changing for the life of the alarm-last 10 years from activation, ideal for hallway detect fires quickly and reduces the false alarms, LED safety light-high intensity LED light-illuminate your escape path to help guide your family to safety, hush button allows you to quickly silence nuisance alarms, sealed lithium battery for life of alarm "Two RF Remote Controls. Two CR2032 3V button cell batties incl. Remote control for arm, disarm and panic. 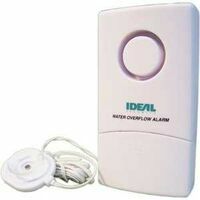 Compatible to Ideal's SK622 wireless dialer/Alarm, SK626 Siren and SK623 garage door alert. Two per package. White. Digital Carbon Monoxide Alarm. Digital Readout for a continuous display of CO levels. Carbon Monoxide alarm alerts you before harmful levels are reached. Battery Operated for a flexible installation for areas with no AC outlets. Peak Level Memory button to recall the highest recorded level of CO. Test and Reset button to test circuiterie et r?initialise l'appareil. Battery operated. "Hush" button to silence nuisance alarm. By linking together when one alarm sounds, all of the others will sound off as well. Kidde 900-0220 Combo Co & Smoke Detector Talking Battery Op.